One of the reasons I love my job is that I am blessed to be able to meet extraordinary people, and tell their stories. Luis Carlos Montalvan is one of those people. 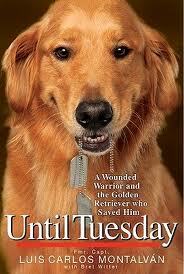 He is a decorated 17 year veteran, who has written a book entitled Until Tuesday. It is about his experiences during two tours in Iraq, but he also shares the story of a dog who he says has saved his life. The dog’s name is Tuesday. The four year old has trained since birth for the job of K9 Service Dog. He, like hundreds of other dogs are helping veterans like Montalvan heal from the physical and psychological scars of war. It’s an intimate relationship that bonds warrior with man’s best friend. Another man who is making a big mark on not only this issue, but many others is filmmaker and philanthropist Charlie Annenberg Weingarten. Explore.org is Annenberg’s outlet to the world. The website includes videos, pictures, and information that educates and inspires. When you meet Annenberg, you get the sense this guy has his pulse on the world. His true love though is Lucky, his 14 year old Golden Retriever, a dog that has traveled to nearly every corner of the country with him. The two have visited schools, the elderly, the aftermath of Katrina, and even death row. Annenberg created www.dogblessyou.org and tells me the response has been overwhelming. War veterans and those currently serving are sending in pictures of themselves with dogs at home and at war. I was honored to interview both men whom I believe have a message that is incredibly powerful, and an intention that is simple and pure.